A directory is a hierarchical structure that stores information about objects on the network. 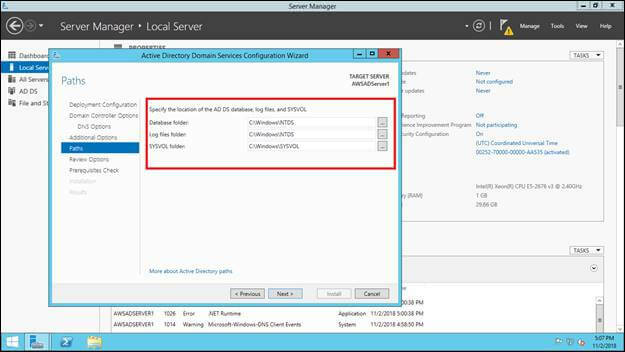 A directory service, such as Active Directory Domain Services (AD DS), provides the methods for storing directory data and making this data available to network users and administrators. For example, AD DS stores information about user accounts, such as names, passwords, phone numbers, and so on, and enables other authorized users on the same network to access this information. 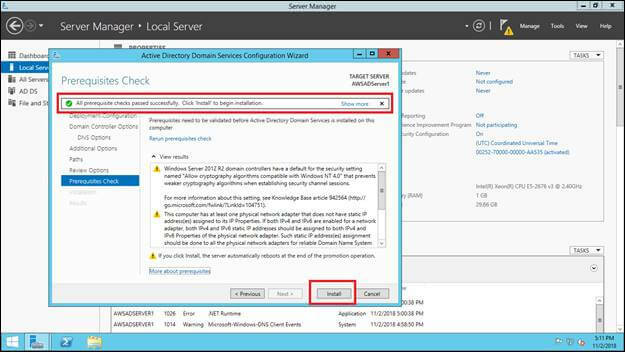 In this topic, we are going to learn about how to install and configure Active Directory in Windows Server 2012. 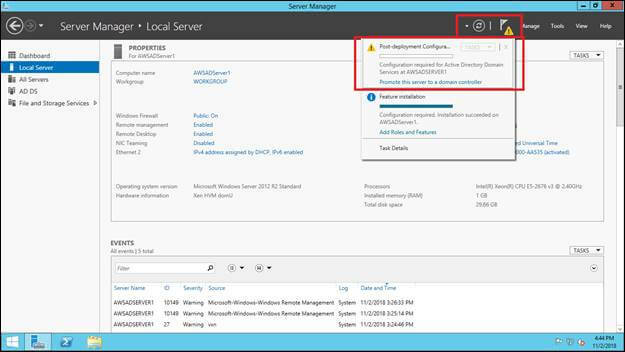 Before discussing this you should have basic knowledge in virtual machine creation in AWS, if not I would recommend seeing this article Azure AWS AD Users Sync Up-Create_AWS_Virtual Machine. 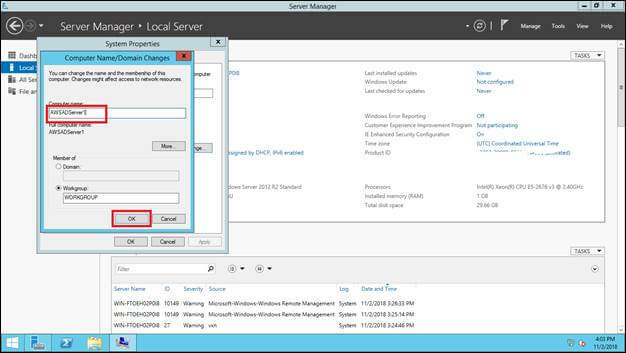 Open the Server Manager and then click Local Server and then click on the Computer name, it will open up a popup window, and there you can change the computer name. 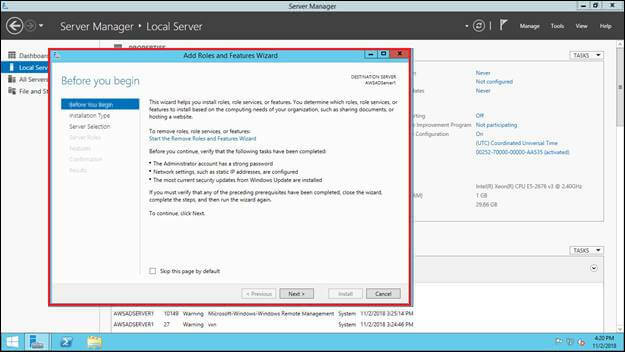 In this topic, we are going to change the computer name to AWSADServer1, once it's done the system will prompt the message for a system restart. 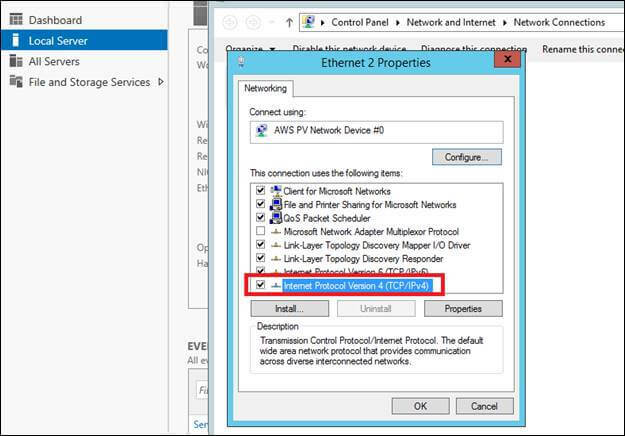 If you want to change/see the IP address which is configured in the system, then click on the Ethernet2 >> it will open up Network Connection window, >> right click on the Ethernet2 and go to properties, >> select Internet Protocol Version 4(TCP /Ipv4) and go to properties. In this article, everything defaults. To Install AD click on Manage and then select Add Roles and Features options, let them default and then click Next button. 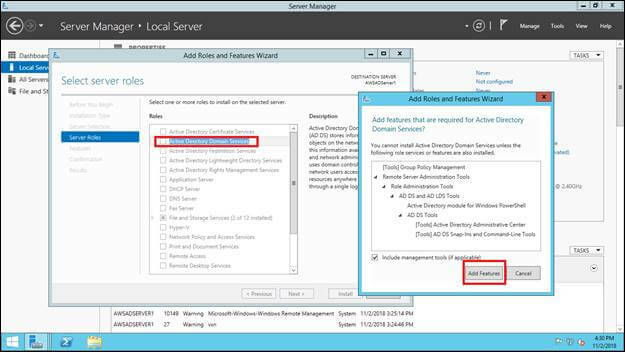 Make sure you have selected role-based or feature-based installing options. 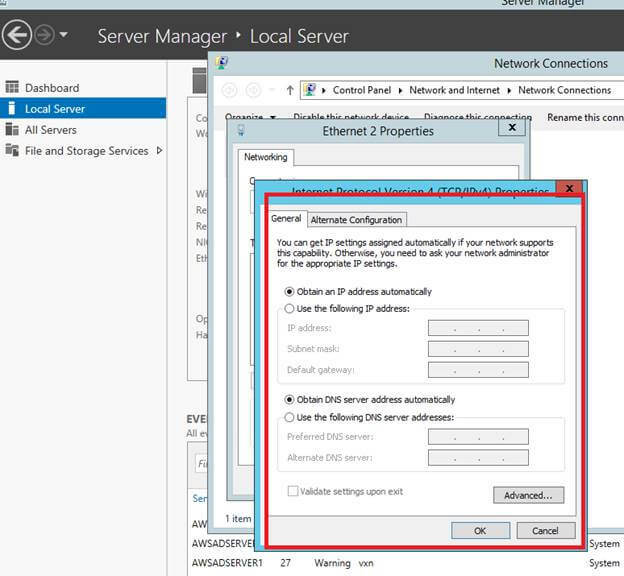 Server Selection will show a list of servers associated with the network if you want to install multiple installation select all, but in this article, we are having only one and click the next button. 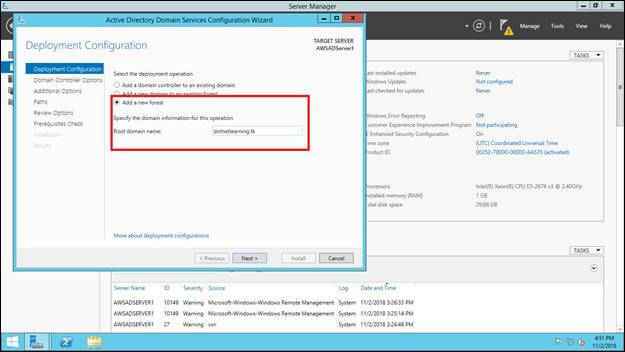 I would recommend installing at least two domain controllers; if one fails then another domain controller will take the login and other network operations. 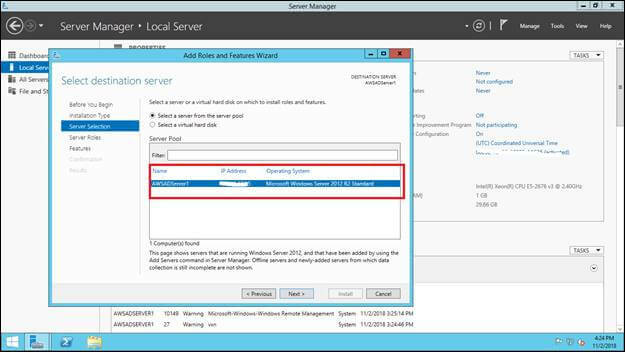 For a best practice always check the server restart options checkbox, then the server will get restarted automatically once the installation is done. 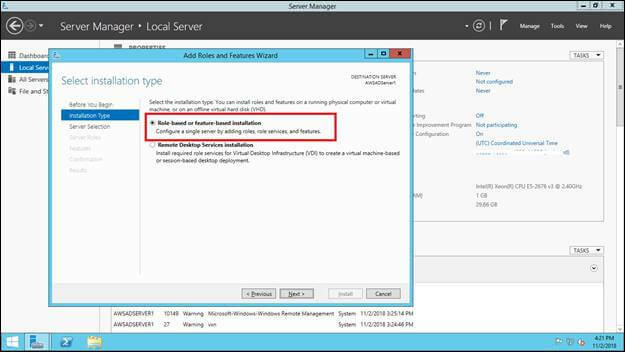 Export configuration settings will allow us to download XML based configure files, it will use this when installing the same settings to the different servers. 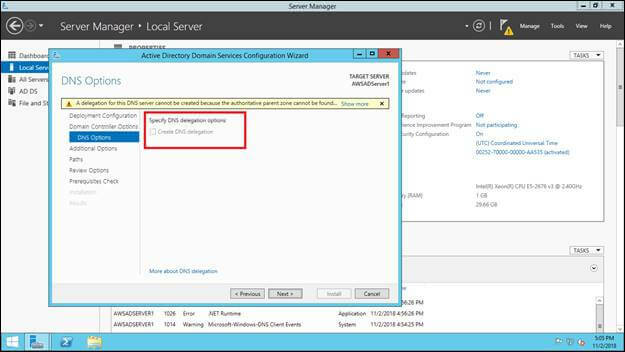 Domain Controller - the system will show the notification for post-deployment configuration. 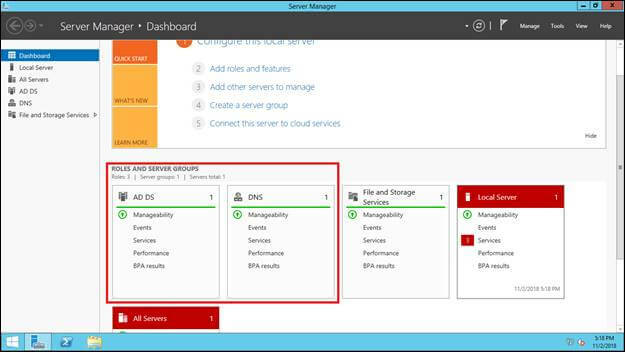 Forest and Domain function level applies on OS level. 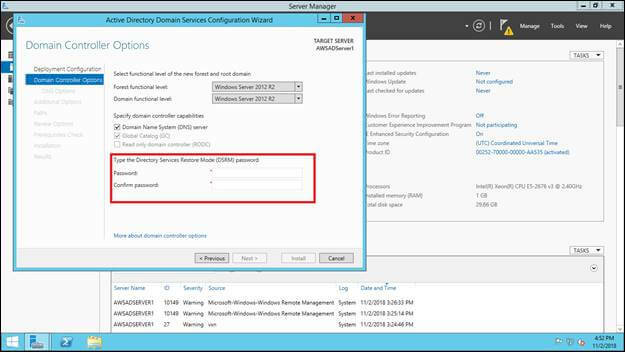 Set the password for the directory services. 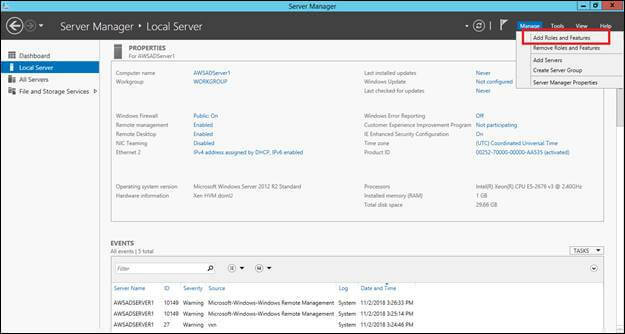 We are getting a warning message on DNS settings windows because we have not specified the DNS setup yet. 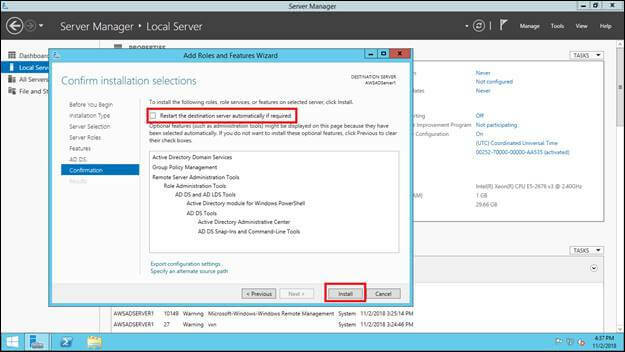 All prerequisite checks are passed then the install button will get enabled and click install. The server will be automatically restarted once the installation is done. 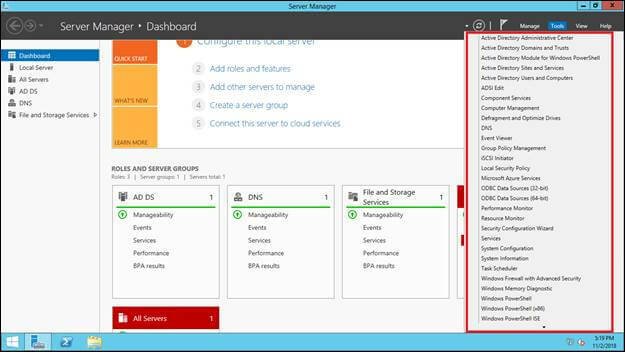 Then open Server Manager, and it will show you AD DS and DNS options. Click on the Tool to get more options about AD configurations.